Mobile Gaming Powers Up: '99 Cents Is The New Quarter' : All Tech Considered Mobile games like Angry Birds and Draw Something have gained huge popularity partly because of one asset: simplicity. As a result, the traditional video game industry is taking note. But not all of them are following the same route. As mobile games gain popularity, some traditional game developers have taken note and created simpler games. 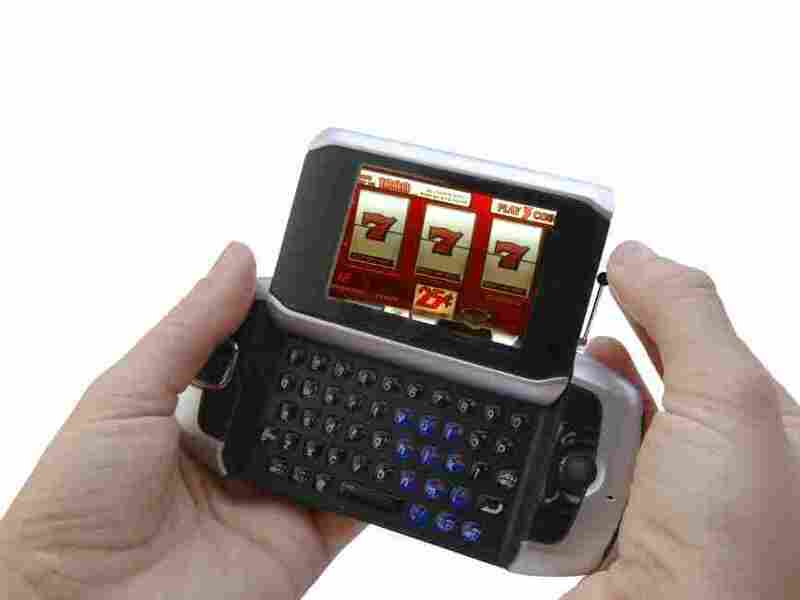 Mobile gaming, or at least playing games on a cellphone, is nothing new. Just think of all the quick, sometimes mundane rounds of Snake you played if you were one of the lucky owners of that brick of a Nokia phone from the late '90s and early 2000s. Yet as smartphones evolved in recent years, the number of games available on them grew rapidly, as well. It has become common to see users of Android phones and iPhones wrapped up in intense sessions of games like Angry Birds or Draw Something. Apple's App Store reached 25 billion downloads early last month, and many of those apps were games. Needless to say, it's a good time to be making games — both video and mobile, says Jamin Warren, founder of Kill Screen Magazine. "It's something that everyone uses," he says in a phone interview. "The simplicity of the iPhone and iPad with touch screens have really pointed to a cool new emergence of simple, simple game design ... something that sort of replicates the old arcade games. I've heard it said that '99 cents is the new quarter.' "
Titles like The Elder Scrolls V: Skyrim and Call of Duty: Modern Warfare 3 are two of the most recent blockbusters that fueled the video gaming industry, which raked in nearly $17 billion in U.S. sales last year. While that may sound like a remarkable amount, the numbers actually fell 8 percent from the previous year. First-person shooter and role-playing games, once wildly popular, are no longer guaranteed success in a fast-changing industry. "The skills needed and the button structure became way more complicated," Warren says. "And that really isolated a lot of folks who were used to the simplicity of early games. A lot of people left the video game market." And that's where mobile games have swooped in. It's not just consumers who have been latching onto the mobile gaming boom — so have some traditional video game developers. Warren notes that over the past five or six years, with the release of the Nintendo Wii and Microsoft Kinect, there has been a return to simplicity. Not everyone wants to figure out complicated game-play structures. Devices like the Wiimote and the Kinect respond to body movement, a more natural way for people to play a game. Warren thinks we're bound to see a lot more of this trend. "I think the industry is going to move in two different directions," he says. "There's going to be the super hard-core, traditional, big-action budget publisher like Rockstar, Take 2, Activision and EA. But I think you're going to see the emergence of smaller, but equally talented, game designers because of their ubiquity." While Zynga — the maker of FarmVille and Words With Friends — is one of the bigger game developers in the mobile world, Warren notes that traditional game designers look at the success of those games and want a piece of the action. You're also seeing some of the people who traditionally would be working on big-budget titles moving over into the mobile space. "Most recently, Seamus Blackley, one of the four founders of the XBox, who worked at Looking Glass Studios and ran the video game department for Creative Artists Agency, a big talent agency ... has made the move into the mobile space [to make] Atari-type games," Warren says. As Apple's mobile iOS and Google's Android operating systems become bigger competitors for distribution, the big three gaming companies (Nintendo, Microsoft and Sony) are trying to differentiate themselves. Nintendo's latest console, the Wii U, scheduled for U.S. release in late 2012, is geared toward creating unique game experiences. Instead of a handheld remote, gamers will use a touch-screen tablet to play the device. Microsoft has transitioned the XBox to become a center of a person's home entertainment experience, instead of a mere gaming device. Sony is taking a different route. The company's new hand-held device, the PS Vita, works in conjunction with the PlayStation 3 and illustrates Sony's desire to be known for mainly creating great game technology. "It's designed for people who really want a device to just play games," Warren says. "It's interesting that they're not trying to move in a direction where they're trying to appeal to everyone." Now that mobile gaming has caught fire worldwide, the marketing to consumers has changed, too. "One of the ways that the [Wall Street] Journal used to position itself was that they were the nation's second read," Warren says. "Everyone has a local newspaper ... but everybody reads The Wall Street Journal. That's the 'second read,' because it covers a lot of different things. I think you're seeing something similar, where Apple and Google are saying, 'Well, everyone needs to own our devices,' but you may own one of these $250 devices." So, what kind of gamer are you these days? Have your habits changed with the popularity of mobile games?